Early Mormon Church history is common knowledge around here. After Joseph Smith founded the faith in upstate New York in the late 1820s, he and his followers were pushed further and further west by their less-than-tolerant neighbors. After Smith was killed in Illinois in 1844 and succeeded by Brigham Young, the church decided to go off the grid. Way off the grid, as in move to Mexico. Yup. Utah was in Mexico at the time. After the Mormons found themselves back in the United States thanks to the Mexican-American War, they formed Utah Territory and began creating counties. Some of the harsh lands west of Salt Lake City were organized as Tooele County. That’s pronounced “too-EL-ah.” It may or may not be named for a Native American leader who may or may not have existed. There’s all sorts of crazy stuff like that out west. Before there was a Tooele County, the area was part of the Goshute homeland. Needless to say not everyone was happy with the change in management. By 1862 Goshute raids of stagecoach lines had become commonplace in Tooele County. In response the 3rd Regiment California Volunteer Infantry under the command of Col. Patrick Edward Connor was sent to Utah Territory to quell the unrest, as well as to keep an eye on the Mormons. With recent anti-government hostilities fresh in everyone’s mind, the federal government was eager to keep a lid on the situation in Utah. Washington being preoccupied with, um, other matters at the time. Connor was well known for his anti-Mormonism. While in Utah he encouraged his soldiers to go prospecting in the hope of finding valuable minerals and attracting non-Mormon settlers to the area. Sure enough gold, silver, lead and zinc deposits were discovered in short order. He also led one of the worst Native American massacres before Wounded Knee. Things settled down somewhat after the Civil War, but Utah Territory continued to do things their own way. For several years prior to statehood, Utah Territory was the only place in the United States where the Republican and Democratic Parties weren’t dominant. Instead, Utahans voted for either the Mormon Church-backed People’s Party, or the non-Mormon Liberal Party. Because Utah was overwhelmingly Mormon, even more so than it is today, People’s Party candidates routinely won by lopsided margins. However, the Liberal Party had a strong following among miners, who thanks in no small part to Connor’s efforts tended to be non-Mormon. While they weren’t nearly strong enough to give the People’s Party problems statewide, they were numerous enough in parts of the state to influence local elections. Nowhere was this more apparent than in Tooele County. Now here’s where it gets interesting. In 1874 local elections were held in Tooele County. Much to the chagrin of church establishment, all of the Liberal Party candidates won. Immediately there were charges of electoral fraud. Unwilling to accept the results, the People’s Party incumbents and their supporters barricaded themselves inside the county courthouse. The standoff didn’t end until a court ruled in favor of the Liberals. 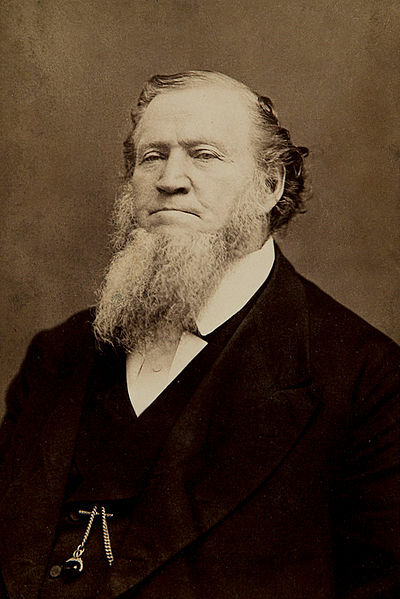 Even then, Brigham Young had to personally intervene to convince pro-Mormon forces to back down. Although there was never any attempt to secede from Utah, the ensuing Liberal-led government was often referred to tongue in cheek as the “Republic of Tooele.” After the Liberals won the 1876 Tooele County elections unopposed it appeared the “Republic” would hang around for awhile. Then the Utah Territorial Legislature got creative. Realizing the Liberals were supported by miners – a virtually all-male demographic – in 1876 the territory gave women the right to vote in local elections, effectively giving Utah Territory full women’s suffrage over 40 years before the 19th Amendment made it federal law. Voter registration was also implemented, which further cut into the Liberal Party’s base of often transient and stubbornly individualist voters. By 1880 Tooele County was back under People’s Party control. Although the Liberal Party still managed to win an occasional election, notably for Salt Lake City mayor in 1890, it never again came close to winning countywide races. Shortly before Utah became a state in 1896, both the Liberal and People’s Parties disbanded, their memberships joining the mainstream Republican and Democratic organizations. This entry was posted in History Wednesday, politics and similar annoyances, propaganda and shame and tagged 19th Amendment, 3rd Regiment California Volunteer Infantry, American Civil War, anti-Mormonism, Bear River Massacre, Brigham Young, Church of Jesus Christ of Latter-day Saints, courthouse, Democrat, gold, Goshute, history, History Wednesday, Illinois, Joseph Smith, LDS, LDS Church, lead, Liberal Party, Mexican-American War, Mexico, mining, Mormon, Mormon Church, mormon church history, New York, Patrick Edward Connor, People's Party, prospecting, Republic of Tooele, Republican, Salt Lake City, silver, suffrage, Tooele, Tooele County, Utah, Utah Territorial Legislature, Utah Territory, Utah War, voter registration, Washington, zinc by W. Lane Startin. Bookmark the permalink.